It has been a momentous year on 1(F) Squadron. We have settled well into life at RAF Lossiemouth, and are about to commence operations from our new Squadron building in the coming days. We are really looking forward to the opening weekend in September, when Air Chief Marshal Sir Peter Squire will be cutting the ribbon and formally opening a magnificent new facility that will be Squadron home for the decades ahead. 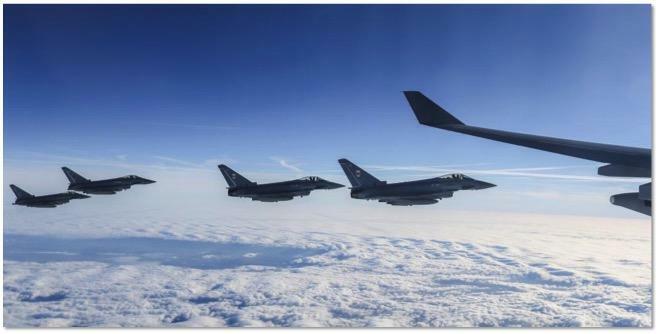 The Winged One arrival at RAF Lossiemouth last September marked the end of 60 years continuous Quick Reaction Alert and fast jet operations at RAF Leuchars, which was a poignant reminder of the significance of that base in the history of the RAF. 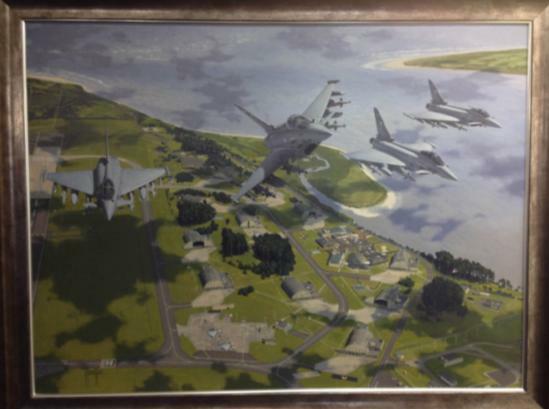 We are extremely lucky to have commemorated the Squadron’s time there with a superb painting that now sits proudly in the new building, with a print copy owned by the Association remaining in the RAF Club. The painting was very generously funded by the Worshipful Company of Barbers. October saw the Squadron commence Quick Reaction Alert activity from RAF Lossiemouth, a task that continues 24 hours a day, 365 days a year. In recent weeks we have launched under Op CONSTANT EFFORT intercepting Russian BEAR aircraft probing the northern edges of the UK FIR, and against civilian aircraft in distress or under threat under Op ADANA. Both of these missions have received significant media attention in the national press. Today we have pilots detached to 1435 Flight in the Falkland Islands, and also on Op AZOTIZE, which is the NATO Baltic Air Policing Mission based in Estonia. The latter has seen considerable activity as a resurgent Russia continues to flex its muscles across the region. As well as QRA, the Autumn also saw the Squadron take part in Ex JOINT WARRIOR, which was a large event including multiple fast jets and ISR platforms, Land Forces, and numerous Royal Navy assets. Our affiliated ship, HMS Duncan, is currently on her maiden voyage and on task in the Middle East. Following this period the Squadron immediately commenced Ex TARTAN FLAG, which was a bespoke work up period for Ex RED FLAG in Jan 15. TARTAN FLAG comprised multi-element sorties with AAR, SENTINEL, Typhoon support from both Coningsby and Lossiemouth, and F15E involvement from Lakenheath. The missions involved a range of swing role, air interdiction and counter air tasks, and were the perfect work up for what lay ahead. This period also marked the culmination of a major capability enhancement to the aircraft called Phase One Enhancement B (P1Eb.) 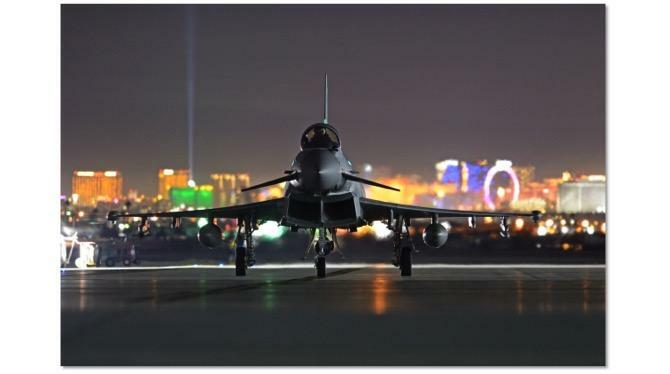 This involved the addition of the Paveway IV to the Typhoon’s strike capability, as well as upgrades to the Helmet Mounted Sighting System and Litening III pod integration. This blend has given the aircraft a true swing-role capability, capable of a seamless transition between air-air and air-ground roles in the same sortie. This new capability was something that would be put firmly to the test during RED FLAG. 1(F) Sqn led the introduction of P1Eb to the frontline, conducting trials and developing the tactics in parallel with 41(R) Test and Evaluation Squadron, having deployed pilots to China Lake throughout the trials period. 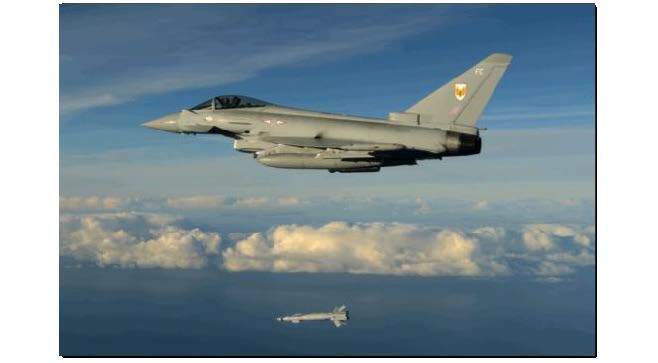 The first Typhoon frontline Paveway IVs were dropped at Cape Wrath in November 14, from a mix of GPS and laser guided deliveries, and proved the fuzes in both impact and airburst modes. It was a wet and windy morning as the sun rose on 5th January and the 1(F) Sqn RED FLAG detachment took off from Lossiemouth to the Azores in 2 waves of 4 aircraft, each accompanied by a VOYAGER tanker from Brize Norton. After night stops at Lajes, Bermuda and an Atlantic crossing that was fairly eye-watering given the time of year, the Typhoons made a final stop at Eglin AFB on the US eastern seaboard before heading west, over the Grand Canyon and onto Nellis AFB. 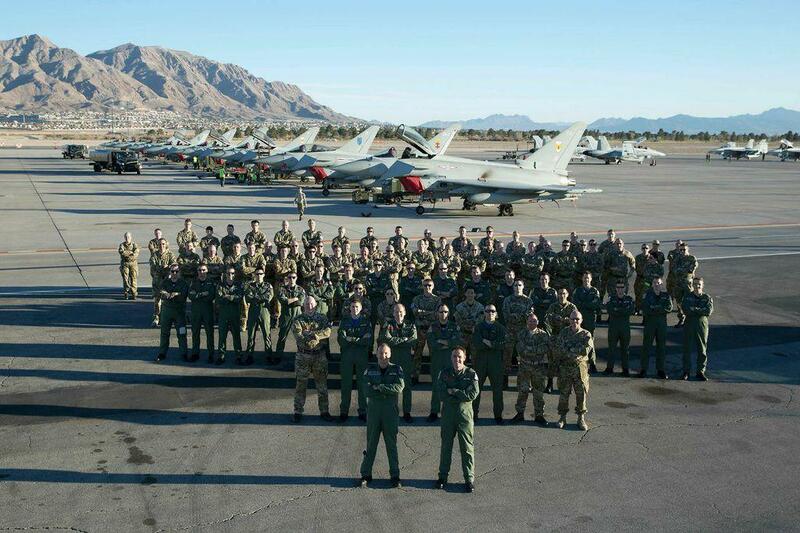 On arrival at Nellis the detachment conducted a week of warm-up flying with the local USAF Squadrons, including Air Interdiction, Time Sensitive Targeting and SEAD with the F16s, Close Air Support with Fighter Weapons School JTACs and A-10s, and Air Combat training with the F22 RAPTORs. RED FLAG was a three-week Exercise, with a day and a night wave every day. 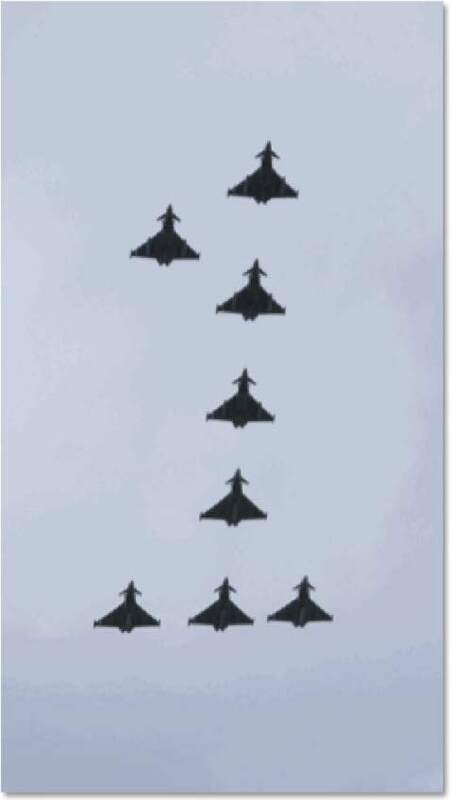 The Typhoon detachment contributed a six ship to each, and conducting a range of air-air and air-ground sorties, including the employment of live Paveway IV as part of the COMAOs. The sorties included integration with F22, B2, F16, F15 and F18, as well as a range of ISR platforms, and provided outstanding training opportunities. The engineers did a magnificent job servicing the aircraft and loading the Paveways, and we barely dropped a sortie for the entire Exercise as a result. The training was world class, relationships were formed and trust gained between units, and the pilots did an excellent job of coping with the demands and complexity of swing role flying in the most contested and challenging training environment in the world. P1Eb worked very well, the Typhoons were reliable, and we employed 23 Paveway IVs in a variety of different modes and profiles by day and night. The detachment was hard work, extremely rewarding, and it was great to relax with a superb Dining Out night at the Stratosphere to celebrate a job well done at the end of the detachment. On arrival back to the UK the Squadron immediately took part in Ex JOINT WARRIOR at Lossiemouth, working closely with a detachment of Turkish F16s which were based at RAF Leeming. This was an excellent opportunity to conduct training and test integration with a NATO ally. The Spring saw a brief let-off from the exercise programme, and the posting of a number of pilots to various instructional assignments and on exchange. We welcomed several new arrivals from the OCU, and have spent the last few months working them up to combat ready standard before the Squadron assumes Very High Readiness status in the coming weeks. 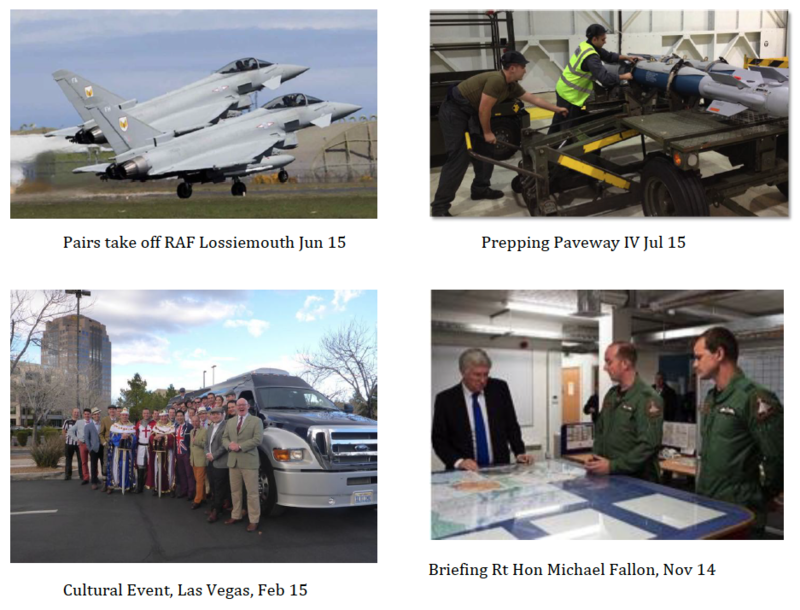 Thereafter, we look forward to Ex TRIDENT JUNCTURE in Albacete, Spain and whatever 2016 has in store for us. But as you know only too well, a fast jet Squadron is about much more than the task and the flying. We have had an amazing few months on the ground as well. The 1(F) Sqn standard has been paraded in front of HM the Queen on 2 occasions (a Royal Visit to RAF Lossiemouth, and at Buckingham Palace for the 75th anniversary of the Battle of Britain). We have hosted HRH Duke of York, the Defence Secretary the Rt Hon Michael Fallon, Air Attaches and Embassy staff from the US and France, Royal Family from the Kingdom of Saudi Arabia, a number of senior military officers from all three services, and a host of others including cadets and local school children. We have recently also been lucky enough to support the Royal Mail with their production of a set of Battle of Britain commemorative stamps. The Squadron’s contribution to sport has been outstanding, with Squadron members representing the RAF at power lifting, badminton, shooting, bobsleigh, golf, mountain biking, basketball, swimming and rugby. Five Squadron members have received commendations in the Queens Birthday and New Years Honours Lists: Sgt Alex Kelly, Flt Sgt Jane Smith, Flt Lt Ben Spoor (posted in from REAPER), Sqn Ldr Jan De Vry, and Sqn Ldr Lewis Cunningham. Very many congratulations to them all for their outstanding achievements. We have also conducted Adventurous Training expeditions in the Scottish Highlands, Force Development in London, and are planning a weeks skiing expedition under the Eagle Scheme in Bavaria during January 2016. Planning is also already underway for a North Coast 500 charity cycling expedition during summer 2016. 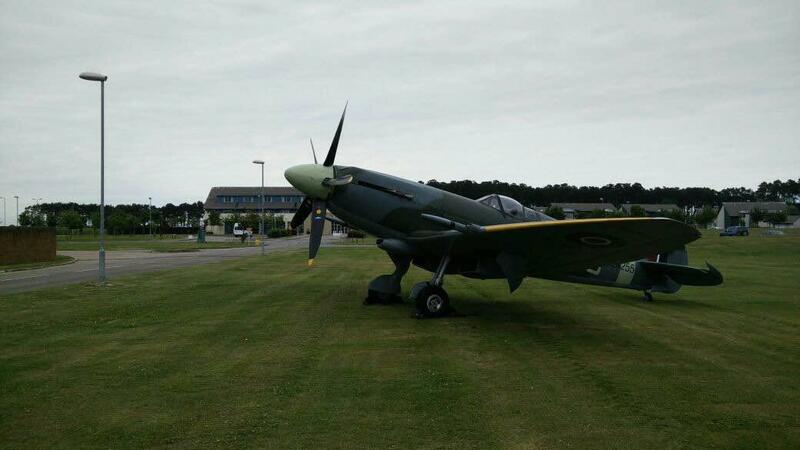 We have also re-built the Squadron Mk 21 Spitfire after its recent road move from RAF Leuchars (and the subsequent removal of 3 ‘radioactive’ dials!) This takes pride of place alongside 14 Typhoon fighters in the hangar, and is enjoying a comfortable centrally heated retirement. It often steals the show during Squadron visits, families days and officers mess events; and received much comment during its recent guest appearance at the RAF Lossiemouth Annual Reception this year. There are also some significant anniversaries for the 1(F) Squadron this year, with the Battle of Britain 75th, and the Centenary anniversary of the Squadron’s first operational deployment over the Western Front during the First World War. We have been lucky enough to commemorate these occasions formally in London, informally on the Squadron, and have recently hung a beautiful stained glass crest in St Aiden’s Church at RAF Lossiemouth, as a very poignant reminder of the Squadron’s glorious past. The illustrious history of the RAF’s premier Squadron is something that we are enormously proud of, and greatly treasure. Some of our amazing history will be on permanent display in our magnificent new building, and if you are passing, please drop in, we would be delighted to show you around. It has been another remarkable year in the history of 1(F) Squadron, and rest assured that the spirit, ethos and dedication of our officers and airman today remains exactly as you would wish it to be.